A wide separation between traffic moving in opposing directions is safer and more comfortable for the motorist than head-to-head traffic in close proximity. While this works well in rural areas, it may be necessary in densely developed areas with expensive right of way to provide a narrower median with a positive barrier. 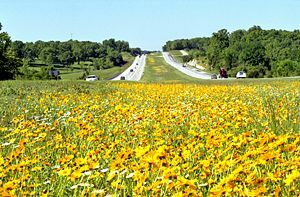 While MoDOT prefers to use the 60 ft. depressed median on rural and urban expressways and freeways, the cost to do so may become excessive. When this occurs, alternative designs for the improvement are to be considered. These alternatives must reflect the principles of clear zone design. Positive median barriers are not always required; however, when they are needed MoDOT uses three basic types. They are concrete barrier, guardrail (Type B) and guard cable. 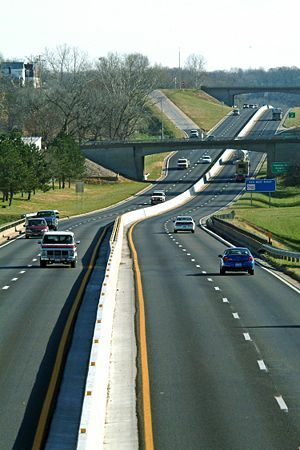 Concrete barrier and guardrail are best when used on flush medians narrower than 36 ft. Type B guardrail (Standard Plan 606.00) is used in those locations in which a median barrier is to be provided but site conditions will not permit the use of a concrete barrier (drainage, visibility requirements, aesthetics, etc.). Concrete barrier is generally limited to high volume roadways with narrow width medians. When concrete barrier is used, Type C (and Type D as required) is the preferred configuration for new construction. Type A (and Type B as required) are only to be used for new construction projects in a retrofit condition or to “tie in” to existing Type A concrete barrier, which exists on adjoining sections of roadway. An approved crash cushion or sloped end crashworthy end terminal is the required end treatment for concrete barriers. A barrier height transition is not used in locations where the posted speed limit is greater than 35 mph. Where height transitions are used, they are located as far as practicable from the traffic lanes, and if possible, the lead end flared outside the clear zone. Concrete barrier details and barrier height transitions are shown in Standard Plan 617.10. The distance between the left hand edge of the lane next to the median and the face of the concrete median barrier is limited to not more than 15 ft. Many existing freeways have medians that are more than 36 ft. in width. These medians are of sufficient width to satisfy clear zone requirements, thus making the provision of median barrier optional. While the provision of a concrete barrier or Type B guardrail may not be required at these locations, a three-strand guard cable may be desirable. Guard cable is effective is these situations and in locations with cross-median accident history. When a median narrower than 60 ft. is provided on an expressway located on a major route, the turning movement requirements of the design vehicle must be considered. In addition, the length of storage area necessary to accommodate the design vehicle within the median must be determined to maximize safe operation of the improvement. A closed median with raised curbs can be an effective design when used on a minor roadway in urban areas. The width of the median in these situations is a function of the turning movements of the design vehicle. Raised curbed medians provide curbs 6 to 8 in. in height, and may be integral, or curb and gutter. Mountable curbs are usually used except where protected left turn lanes are provided or where a vertical curb face is specified. Where vertical curb face is used, the curb is offset from the edge of the traffic lane by at least 1 ft. for continuous medians and at least 2 ft. for islands and short median sections. Raised curbed medians are used where depressed medians cannot be provided and on roads other than freeways with volumes of traffic under 20,000 AADT. Continuous raised medians 10 ft. or less in width are usually paved and those wider than 10 ft. are usually sodded. Short raised medians are paved. With concrete paved traffic lanes or curb and gutter, the raised median is paved with asphaltic concrete or portland cement concrete. Where the traffic lanes are asphaltic concrete the raised median is paved with asphaltic concrete. Plans show details for doweling of concrete median strip to previously constructed pavement. Details of the face of curb on concrete median strip are the same as shown on standard plans. The concrete area of irregular shaped medians is computed by the square yard. The concrete area of medians of uniform width is computed by the linear foot. The same unit of measurement for median quantities is used on a project to reduce the number of bid items. Payment for constructed median is made under the item concrete median or concrete median strip. Medians using asphaltic concrete are paid for by the ton of required asphaltic concrete material. Painted flush medians are provided on all multi-lane roadways when median widths are 4 ft. or less. A minimum median width of 4 ft. is used where feasible. Painted median lines consist of two solid yellow lines in each direction. This page was last modified on 24 November 2010, at 12:13.